Since the 5D has come out, it’s been a force to be reckoned with in the digital video industry – after years of toiling away with tiny apertures and tiny 2/3″ sensors (about the size of those found on your typical compact point and shoot digital camera) on even the highest end consumer/prosumer video cameras (even those cameras approaching $10k), there was finally a product which could provide quality on par with cinema-quality movie cameras (even better, actually – the 36x24mm sensor has about twice the capture area of the film typically used for movies). 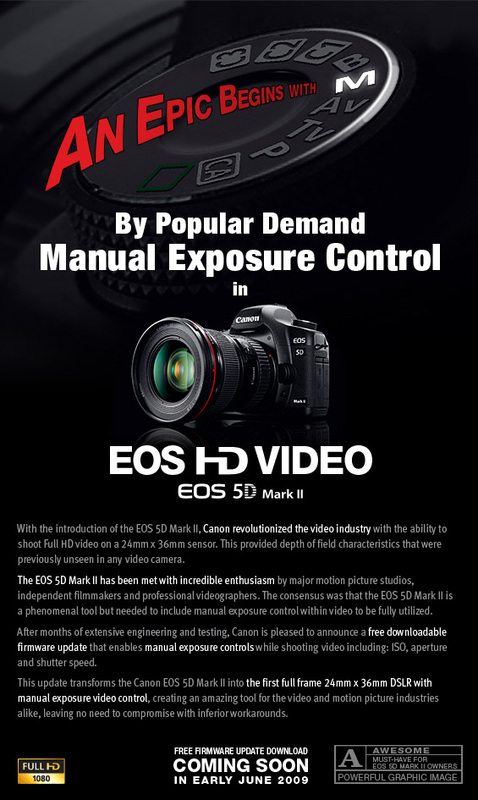 With a huge array of lenses to choose from, the availability of large aperture lenses to provide shallow depth of field, and extreme high-ISO ability for low-light situations, the 5D Mark II has the hardware potential to be a low-cost consumer solution for creating professional-quality video. One of the biggest things in its way, however, was the crippling of controls that left the 5D Mark II operating essentially in automatic program mode while recording video – no way at all to control shutter speed or aperture, which are critical in achieving the desired blur and depth of field attributes in an image. To its defense, the only camera to-date to provide manual controls is Panasonic’s GH1 – Nikon doesn’t offer manual control either in its D90 or D5000. But the point was a huge stickler that, control-wise, made the 5D Mark II more a video camera for snapshot home videos than cinema-quality movies. Originally I had guessed that Olympus or Panasonic or Samsung would be the first ones to move in on the market, and that Nikon would provide a fully capable video DSLR system long before Canon did; to me, the reasoning behind Canon crippling the video ability on its DSLRs was simple – unlike other DSLR manufacturers, Canon already has a lucrative range of prosumer and professional digital video cameras that a fully capable DSLR selling under $3k, or even under $1k for its APS-C Rebel T1i, would almost completely cannibalize. For reasons unknown, however, Canon is now releasing a firmware update that provides full aperture, shutter speed, and ISO control (ISO only goes up to ISO6400, however…) in video mode. This is huge news, and gives the 5D Mark II the potential to become the undisputed king of digital video devices – its image sensor certainly has the potential to blow away even the most expensive $100K professional videocamera you can buy. Now just about the only big features left on DSLR video enthusiasts’ list is variable framerate recording – currently the 5D Mark II is stuck at 30fps, which doesn’t jive well with 25fps PAL displays nor 24fps cinema displays, and produces a distinct “cheap home video” effect to movement. But perhaps Canon’s willingness to provide new capabilities by way of firmware updates – quite a break from their traditional corporate philosophy – signals a newfound willingness to listen to the consumer base and improve. This entry was posted on Thursday, May 28th, 2009 at 19:29	and is filed under News. You can follow any responses to this entry through the RSS 2.0 feed. You can leave a response, or trackback from your own site.